The Messerschmitt Me 410 Hornisse ('Hornet') was a German heavy fighter and Schnellbomber used by the Luftwaffe during World War II. Though essentially a straightforward modification of the Me 210, it was designated the Me 410 to avoid association with its notoriously flawed predecessor. Development of the Me 210 had been under way since 1939 but the aircraft proved extremely unstable and was never considered for full-scale production. 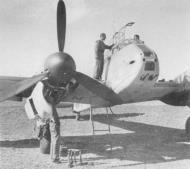 Modifications to the layout produced the Me 210C and 210D, which proved somewhat superior. As studies progressed on the Me 210D, and with a separate parallel attempt to improve upon the 210 with the Messerschmitt Me 310 in the second half of 1943 — which provided almost no aerodynamic improvement over the 210's risky handling qualities — it was instead decided to introduce a 'new' model, the Me 410. The major change between the Me 210 and 410 was the introduction of the larger (at 44.5 litre, 2,715 in3 displacement) and more powerful Daimler-Benz DB 603A engines, which increased power to 1,750 PS (1,730 hp, 1,290 kW) compared to the 1,475 PS DB 605s used on the Me 210C - the interim Me 310 design experiment actually used the DB 603 powerplant choice first. The engine performance increased the Me 410's maximum speed to 625 km/h (388 mph), greatly improved rate of climb, service ceiling, and most notably the cruising speed, which jumped to 579 km/h (360 mph). It also improved payload capability to the point where the aircraft could lift more war load than could fit into the bomb bay under the nose. To address this, shackles were added under the wings for four 50 kg (110 lb) bombs. The changes added an extra 680 kg (1,500 lb) to the Me 210 design, but the extra engine power more than made up for the difference. The new version included a lengthened fuselage and new, automatic leading edge slats, both of which had been tested on Me 210s and were found to dramatically improve handling. The slats had originally been featured on the earliest Me 210 models, but had been removed on production models due to poor handling. When entering a sharp turn, the slats had a tendency to open, due in part to the turn causing a drop in air pressure at the leading edge of the wings, analogous to the low pressure activation the slats were designed for in a slow landing approach (this problem was first observed on the Bf 109V14 and V15 prototypes for the Bf 109E), which added to the problems keeping the aircraft flying smoothly. However, when the problems with the general lateral instability were addressed, this was no longer a real problem. The wing panels of the earlier Me 210 had been designed with a planform geometry that placed the aerodynamic center in a rearwards direction in comparison to the earlier Bf 110, giving the outer sections of the wing planform beyond each engine nacelle a slightly greater, 12.6° leading edge sweepback angle than the inner panels' 6.0° leading edge sweep angle. This resulted in unreasonable handling characteristics in flight for the original Me 210 design. The new Me 410 outer wing panels had their planform geometry revised to bring the aerodynamic center further forwards in comparison to the Me 210, thus making the leading edge sweepback of the outer panels identical to the inner wing panels with both having identical 5.5° sweepback angles, which improved handling. Deliveries began in January 1943, two years late and continued until September 1944, by which point a total of 1,160 of all versions had been produced by Messerschmitt Augsburg and Dornier München. When it arrived, it was liked by its crews, even though its improved performance was not enough to protect it from the swarms of high performance Allied fighters they faced at this stage of the war. The Me 410 night bomber proved to be an elusive target for the RAF night fighters. The first unit to operate over the UK was V./KG 2, which lost its first Me 410 on the night of 13–14 July 1943, when it was shot down by a de Havilland Mosquito of No. 85 Squadron RAF. The Me 410 was also used as a bomber destroyer against the daylight bomber formations of the USAAF, upgraded through the available Umrüst-Bausätze factory conversion kits, all bearing a /U suffix, for the design — these suffixes could vary in meaning between subtypes. As one example, the earlier Me 410 A-1/U1 designation signified a camera-fitting in the undernose ordnance bay for reconnaissance use (as the A-3 was meant to do from its start), while the same /U1 designation or the later Me 410 B-2 signified a mount of a pair of the long-barreled, 30mm calibre MK 103 cannon in the undernose ordnance bay. The /U2 suffix designated a fitment of two additional 20 mm MG 151/20 cannons in the under-nose ordnance bay instead — the A-1/U4 subtype fitted the massive, 540 kg (1,190 lb) weight Bordkanone series 50 mm (2 in) BK 5 cannon, loaded with 21 rounds in the same undernose ordnance bay in place of either the /U1's cameras or MK 103s, or the /U2's added pair of MG 151/20 autocannon. For breaking up the bomber formations, many Me 410s also had four underwing tubular launchers, two per wing panel, firing converted 21 cm (8 in) Werfer-Granate 21 infantry barrage rockets. 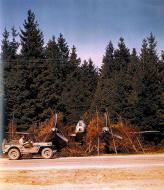 Two Geschwader, Zerstörergeschwader 26 and 76, were thus equipped with the Me 410 by late 1943. They were moderately successful against unescorted bombers through 1943, with a considerable number of kills against USAAF day bomber formations being achieved. However, the Me 410 was no match in a dogfight with the lighter Allied single-engine fighters such as the North American P-51 Mustang and Supermarine Spitfire. In early 1944, the Me 410 formations encountered swarms of Allied fighters protecting the bomber streams, usually flying far ahead of the combat box formations as an air supremacy move in clearing the skies of any Luftwaffe opposition, resulting in the Me 410's previous successes against escorted bombers now often being offset by their losses. An example of this — as part of a campaign started two days earlier by the USAAF — was on 6 March 1944 during an attack on Berlin by 750 8th AF heavy bombers, when 16 Me 410s were shot down in return for eight B-17s and four P-51s (which were destroyed by Bf 109 and Fw 190 fighters escorting the Me 410s). The following month on 11 April, with 8th AF raids hitting Sorau, Rostock and Oschersleben, II./ZG 26's Me 410s accounted for a rare success, initially bringing down 10 B-17s without any losses. During the course of the same raid, their second sortie was intercepted by P-51s that destroyed eight Me 410s and three Bf 110s. Sixteen crewmen were killed and three wounded. From mid-1944, despite being Hitler's favourite bomber destroyer, the Me 410 units were taken from Defence of the Reich duties and production was phased out in favour of heavily armed single-engine fighters as dedicated bomber destroyers, with the Me 410s remaining in service flying on reconnaissance duties only. Some Me 410s were used with Junkers Ju 188s during the Battle of Normandy, for high-altitude night reconnaissance. The basic A-series aircraft were armed with two 7.92 mm (.312 in) MG 17 machine guns and two 20 mm MG 151/20 cannons in the nose and delivered as the Me 410 A-1 light bomber. The originally planned Me 410 A-2 heavy fighter was cancelled because the dual 30 mm (1.18 in) MK 103 cannon mount, also available for the later Me 410B-2 subtype as the aforementioned Umrüst-Bausatz /U1 factory ordnance upgrade available by 1944, was not ready in time. The Me 410A featured a bomb bay for carrying air-to-ground ordnance or for the installation of additional air-to-air weaponry or other equipment. Initially, three Umrüst-Bausätze (factory conversion kits) were available, U1 contained a palette of cameras for the photo-reconnaissance role, U2 two 20 mm MG 151/20 cannon with 250 rpg for the heavy fighter use, and U4 used the 50 mm (2 in) Bordkanone series weapon, the BK-5 cannon with 22 rounds (21 rounds to load and 1 extra round already loaded into the cannon), to turn either an Me 410A or B-series aircraft into a dedicated bomber destroyer. 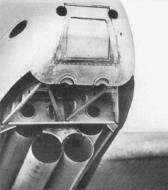 The BK 5 cannon - derived from the Panzer III tank's main armament, the 50 mm (2 in) KwK 39 L/60 - allowed the Me 410s to shoot at their targets from over 914 m (1,000 yd), a distance at which the bombers' defensive armament, usually consisting of the 'light-barrel', .50 calibre AN/M2 aviation version of the M2 Browning machine guns, was useless. Frequent problems with jamming and limited ammunition supply, together with the extra 540 kg (1,200 lb) weight of the large-calibre gun under the nose, made the other anti-bomber versions of Me 410, especially those with extra 20 mm MG 151/20s, much more useful. The dedicated reconnaissance version Me 410 A-3 received a deeper fuselage for additional cameras and fuel. The Me 410 A-3 entered service in small numbers in early 1944, and equipped three long-range reconnaissance Aufklärungsstaffel reconnaissance squadrons, usually assembled with other recon squadrons as parts of larger, three or four-squadron Fernaufklärungsgruppen (one Gruppe on the Western Front and the other two on the Eastern Front). The Me 410B-series was largely the same as the A-series, but replaced the pair of 7.92 mm (.312 in) MG 17s with a pair of the harder-hitting 13 mm (.51 in) MG 131 machine guns. The originally planned 1,900 hp (1,400 kW) DB 603G engine had been cancelled in early 1944, so all Me 410Bs used DB 603A or DB 603AA engines. The DB 603G would have increased the maximum speed to 630 km/h (392 mph), and cruising speed to 595 km/h (370 mph), although the weights increased once again. The versions were the same as with the A-series, the Me 410 B-1, and Me 410 B-3 filling the same roles as the earlier A-1, and A-3 versions, also with the options of using the same Umrüst-Bausätze factory conversion kits as the A-series aircraft used. Several experimental models were also developed. The Me 410 B-5 added shackles under the fuselage to carry a torpedo, and removed the MG 131s in the nose to make room for the FuG 200 Hohentwiel 550 MHz UHF-band maritime patrol radar. The bomb bay was not used in this version in order to make room for a 650 L (170 US gal) fuel tank, and the rearward-firing remote turrets were replaced by another 700 L (180 US gal) fuel tank for long-range missions. The Me 410 B-6 was a similar anti-shipping conversion, but intended for the short-range coastal defence role only. For this mission, it did not use a torpedo, and was instead a simple modification of the B-1 with the FuG 200 radar. The Me 410 B-7/B-8 were updated B-3 reconnaissance models that were only built as prototypes. The Me 410C was a high-altitude version drawn up in early 1944, with two new wing designs that increased span to 18.25 m (60 ft) or 20.45 m (67 ft). The larger wings allowed the gear to retract directly to the rear. A new universal engine mount would allow for the use of any of the DB 603JZ or BMW 801J turbocharged engines or the Jumo 213E two-stage mechanically supercharged engines, driving a new four-blade propeller with very wide blades. The BMW 801 radials were air-cooled and the DB 603 and Jumo 213 used an annular radiator, all housed as unitized Kraftei (power-egg) engine 'modules' onto an airframe for ease of installation and field maintenance, so the normal under-wing radiators were removed. None were ever built, as Me 410 production was canceled before the engines matured. The Me 410D was a simpler upgrade to the B-series to improve altitude performance, but not to the same degree as the C-series. It would be powered by the DB 603JZ engines, and had a revised forward fuselage to increase the field of view of the pilot and reduce drag. 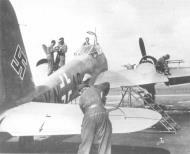 It also replaced portions of the outer wing panels with ones made of wood to conserve strategic materials. Several were built, but like many other attempts at wood construction by the German aviation industry late in World War II, the loss of the Goldschmitt Tego film factory in Wuppertal, in a Royal Air Force nighttime bombing raid, meant the acidic replacement adhesives available were too corrosive to the materials being bonded, and the wooden portions tended to fail. Production was eventually cancelled to concentrate on Bf 109Gs in August 1944, after 1,160 Me 410s had been built, the month after the Jägernotprogramm had gone into effect. Royal Air Force received at least two captured aircraft during war and shortly after. No. 1426 Flight RAF operated a single Me 410 A-1/U2 (WNr.10259, RAF serial TF209) during the war. Soviet Air Force tested at least one captured Me 410 B-2/U4 (WNr.130379) after the war. This aircraft is part of the collection of the RAF Museum and is publicly displayed at the Royal Air Force Museum Cosford. It was built in late 1943 by Messerschmitt in Augsburg. There is evidence it served with Zerstörergeschwader 26 before being surrendered at Vaerlose, Denmark in May 1945. It was one of six Me 410s that were taken to the UK in 1945 for evaluation, but the only one to be later selected for preservation and to avoid being scrapped. It underwent restoration in 1986, after which both engines were successfully run on the ground. It was moved to Cosford in 1989 and has remained there since. The first Me 410A-1 Schnellbomber (fast bomber) was delivered to the Luftwaffe in January 1943 with a fixed forward-firing armament of 2 × 20 mm MG 151/20 cannon and 2 × 0.312 in (7,92 mm) MG 17 machine guns, a defensive armament of 2 × 0.51 in (13 mm) MG 131 trainable rearward-firing machine guns in two remotely controlled barbettes on the sides of the fuselage immediately to the rear of the wing trailing edges, and provision for 2,205 lb (1.000 kg) of disposable stores in a weapons bay located in the lower part of the forward fuselage: this bay could carry 1 × 2,205 lb (1.000 kg) SC-1000 or SD-1000 bomb, or 2 × 1,102 lb (500 kg) SC-500 bombs, or 8 × 110 lb (50 kg) SC-50 bombs; the type could also be fitted under the wing roots with tandem pairs of Aussen-ETC racks for the carriage of an additional 4 × 110 lb (50 kg) SC-50 bombs. The bombs were aimed with the aid of a Stuvi 5B dive-bombing sight. Me 410A-1/U2: Heavy fighter version, fitted with a pallet (Waffenbehalter) with 2 × 20 mm MG 151/20 cannon fixed forward/firing in the weapons bay, 250 rounds each. Me 410A-1/U4: Bomber-destroyer version. This model had the standard forward-firing gun battery replaced by a single 50 mm BK 5 gun with 21 rounds of ammunition in a cylindrical magazine and aimed with the aid of a ZFR 4a sight. Me 410A-2 Zerstörer: Whereas the Me 410A-1 was a fast light bomber, the Me 410A-2 was a heavy fighter. It was identical to the Me 410A-1 and carried exactly the same gun and internal bomb armaments, but lacked the Stuvi 5B dive-bombing sight and provision for the four external 110 lb (50 kg) bombs. A number of aircraft were later fitted as a bomber destroyer. Me 410A-2/U4: Bomber destroyer version. These aircraft retained the standard forward-firing gun battery in combination with a single 50 mm BK 5 gun supplied with 21 rounds of ammunition from a cylindrical magazine. Me 410A-3: This model was the direct result of the Luftwaffe’s general lack of satisfaction with the Me 410A-1/U1 in the Zerstrer role. In this variant the 2 × 0.312 inch (7,92 mm) MG 17 machine guns were eliminated and the lower line of the forward fuselage was deepened to allow the incorporation of two Rb 20/30, Rb 50/30 or Rb 75/30 cameras in the former weapons bay. The Me 410A-3 entered service in limited numbers from a time early in 1944, and equipped three long-range Zerstrer Staffeln (one on the Western Front and the other two on the Eastern Front). Me 410B-1: This version followed the Me 410A series in April 1944 on the productionlines. The main difference was the uprated powerplant: 2 × Daimler-Benz DB 603G inverted-Vee, rated at 1,900 hp (1.417 kW) each. It had the same dimensions as the Me 410A-1/U2. Other differences include its empty weight of 17,598 lb (7.982 kg), normal take-off weight of 24,772 lb (11.237 kg), max level speed of 392 mph (630 km/h) at 26,575 ft (8.100 m) declining to 364 mph (585 km/h) at 13,125 ft (4.000 m), max cruising speed of 370 mph (595 km/h) at optimum altitude, endurance 2 hours 24 minutes, and climb to 26,245 ft (8.000 m) in 22 minutes 30 seconds with maximum weapon load. The versions of the Me 410B-1 at first were identical to the Me 410A series, so the Me 410B-1 was the basic Schnellbomber. Me 410B-1/U2: Heavy fighter version, fitted with a pallet (Waffenbehalter) with 2 × 20 mm MG 151/20 cannon fixed forward/firing in the weapons bay, 250 rounds each. Me 410B-1/U4: Bomber-destroyer version. This model had the standard forward-firing gun battery replaced by a single 50 mm BK 5 gun with 21 rounds of ammunition in a cylindrical magazine and aimed with the aid of a ZFR 4a sight. Me 410B-2: This was the equivalent to the Me 410A-2 series, in the form of a heavy fighter. Several variants exist. Me 410B-2/U2: The fixed forward-firing armament was augmented by the addition of a weapons-bay pallet Waffenbehalter with 2 × 20 mm MG 151/20 fixed forward-firing cannon, 250 rounds each. Me 410B-2/U4: Bomber-destroyer variant with a formidable fixed forward-firing armament of 2 × 30 mm MK 103 cannon (replacing the two 20 mm cannon and two 0.312 in/7,92 mm machine guns on the basic fighter) in combination with 1 × 50 mm BK 5 gun supplied with 21 rounds of ammunition from a cylindrical magazine. Me 410B-2/U2/R2: Fitted with an additional 2 × 30 mm MK 108 cannon. Me 410B-2/U2/R3: Fitted with an additional 2 × 30 mm MK 103 cannon. Me 410B-2/U2/R4: Fitted with an additional 2 × 20 mm MG 151/20 cannon. Me 410B-2/U2/R5: Fitted with an additional 4 × 20 mm MG 151/20 cannon. Me 410B-3: This was the long-range Zerstrer variant of the Me 410B model analogous to the Me 410A-3, and therefore had the 2 × 0.312 in (7,92 mm) MG 17 machine guns eliminated and lower line of the forward fuselage deepened to allow the incorporation of two Rb 20/30, Rb 50/30 or Rb 75/30 cameras in the former weapons bay. Me 410B-5: Produced only in small numbers and used mostly for experimental work, this was a torpedo bomber version of the standard Me 410B with the 2 × 0.312 in (7,92 mm) MG 17 machine guns deleted, FuG 200 Hohentwiel air-to-surface search radar fitted, and provision made for a disposable armament of 1 × 1,984 lb (900 kg) LT F5b torpedo, or 1 × 1,675 lb (760 kg) LT F5i torpedo, or 1 × 3,968 lb (1.800 kg) SC-1800 bomb, or 2 × 882 lb (400 kg) BT-400 bomb-torpedoes, or 6 × 440 lb (200 kg) BT-200 bomb-torpedoes carried as two under the fuselage and four under the outer wing panels. The type also had provision for the defensive gun barbettes to be replaced by a 154 Imp gal (184.9 US gal, 700 liter) auxiliary fuel tank, and as the disposable load was carried externally the former weapon bay was adopted to carry a 143 Imp gal (171.7 US gal, 650 liter) auxiliary fuel tank. Me 410B-6: This was a heavy fighter optimized for the coastal anti-shipping role with FuG 200 Hohentwiel air-to-surface search radar and a gun armament of 2 × 30 mm MK 103 cannon, 2 × 20 mm MG 151/20 cannon and 2 × 0.51 in (13 mm) MG 131 machine guns. Me 410B-7: This was another model that was built only in very small numbers and used mostly for development work as a Zerstrer fighter optimized for the day role. Me 410B-8: This was another model that was built only in very small numbers and used mostly for development work as a Zerstrer fighter optimized for the nocturnal role with flares carried in the weapons bay. Me 410C: Early 1944 this version was planned. It was to have a much higher performance at higher altitudes, even while carrying heavier weapons loads and sometimes night intercept radar. Two new wings were designed, increasing span to 60 ft or 67 ft (18.25 m or 20.45 m). The powerplant would by 2 × Daimler-Benz DB 603JZ, or 2 × Junkers Jumo 213E/JZ, or 2 × BMW 801TJ. All engines would be fitted with turbosuperchargers, and drive four-bladed propellers with very wide blades. The Daimler-Benz's would be fitted with a annular nose radiator in stead of the usual ones under the rear part of the wings. The main landing gear would retract straight to the rear, while twisting the wheels 90 degrees. However, since the air industry was suffering seriously the Me 410C program was abandoned before any production aircraft were built. Me 410D: This version was considered in stead of the Me 410C series. It was powered by 2 × Daimler-Benz DB 603JZ inverted-Vee engines, and had a revised forward fuselage to increase the field of view of the pilot and cause lower drag. In this version the outer wing panels would be made out of wood, to conserve strategic materials. The Me410D series failed because of, amongst others, problems with adhesives and structural failures in the wooden parts. Me 410H: This interim version would replace the Me410D series, and was basically identical to the Me 410B-2. This version however had extra untapered wing panels between the engines and the outer wing panels. Span would have increased to 75 ft (23 m), but the first conversion was never completed. 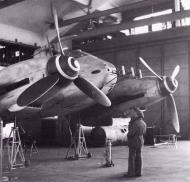 The Me410 served in many theatres, like the North-European, Mediterranean, and Eastern Theatres. Many aircraft were built as Zerstrer aircraft, since the Me 410 had a good range and good performance. Another version in which it was extensively used was that of the Bomber destroyer. By mid-1944 most surviving Me 410's were operated in the Defence of the Reich against day bombers. The good speed and heavy armament brought down many bombers, but overall score was probably about even since the Me 410 were easy targets for the much more nimble North American P-51's and Republic P-47's, who were escorting the bombers. Vulnerable to single-engined fighters because of inadequate defensive armament. Caldwell and Muller 1994, p. 137. Caldwell and Muller 1994, p. 198. Simpson, Andrew. 'Museum Accession Number 85/A/78, Individual History: Messerschmitt Me410A-1/U2 W/NR.420430/AM72/8483M.' Royal Air Force Museum, 2007. Retrieved: 23 December 2011. Wagner and Nowarra 1971, p. 261. Rechlin E'Stelle Erpr. Nr. 1929. Br.B.Nr. 773/43 g.Kdos.